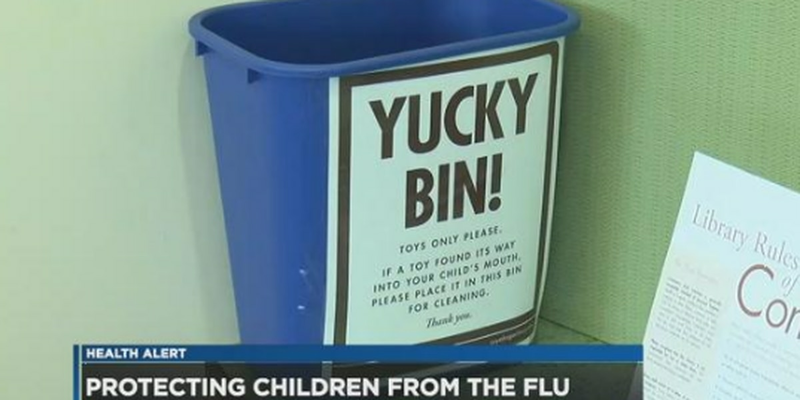 CLEVELAND, OH (WOIO) - It's been one of the worst flu season it recent decades, and it's been deadly early. So far, the flu virus has been linked to the deaths of at least 30 children nationwide. Three of those have happened in Ohio. The flu is now considered "widespread" in every state except Hawaii. Faced with such a serious flu season, local libraries, museums, and children's centers are all working to stop the spread of germs. Cuyahoga County Public Library branches are using janitorial services on a daily basis, and they're wiping down desks, shelves, tables, and books. "We get some increased foot traffic in the wintertime. Parents are looking for things to do with their children, and they can't always go outside, so they'll come here, participate in our story time programming," said Director of Facilities Jeremiah Swetel. He says that's about the time they ramp up their cleaning efforts. "We want to provide a healthy and safe environment for all of our patrons, and we want the experience of coming to the library to be one where they're not having to worry about taking anything home other than a material from the library," said Swetel. The library isn't the only one working hard to keep the germs at bay. The Great Lakes Science Center sent us a statement, detailing what they're doing to keep things extra clean. "Safety and cleanliness are priorities at Great Lakes Science Center year-round, regardless of the season. After guests leave for the day everything is sprayed down with disinfectant by our museum floor staff, including counter tops and desks. Cleaning supplies are stationed throughout the museum for staff members to use anytime extra clean-up is required. Daily cleanliness both in the exhibit areas, and within the restrooms, is maintained by two full-time janitorial cleaning staff members with additional deep cleaning performed at night by a night-crew from the janitorial services company. There are also hand sanitizer stations in our restrooms and at various points within the museum. We share everyone's concern about this flu season, and encourage our guests and staff members to remember that nothing is more effective in halting the spread of germs than frequent hand-washing." Even though the flu season has started, it's not too late to get the flu shot. It could help protect you from getting the virus entirely, and if you still get it, it could be the difference between a nasty nuisance and a trip to the hospital.